These thickly cut Kettle Chips provided a firm and at times, brittle crunch, that was sustained throughout the eating process, where, at no time, did the Chips turn mushy. These All Natural Kettle Cookeds had a load of irregularly shaped Chips, plus a few bent and folded guys in the bag. They were fairly thick and had plenty of oil bubbles of different sizes, which created a bumpy and heavily orange color seasoned landscape. A bit like Arizona! 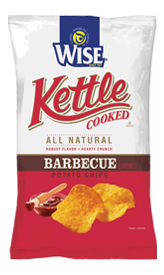 The first thing we noticed was that all the bad stuff featured on the nutrition label for these Kettle Cooked Chips were the same numbers as for Wise's regular Chips. Ordinarily, Kettle Chips are even less healthy! A Nose Plunge Test revealed a tiny barbecue aroma. The taste lacked character: There was no heat, particular smokiness, or tang. The mix with the potato and oil however, brought on a really warm and pleasant Barbecue taste. These Chips were moreish, but we couldn't work out why.